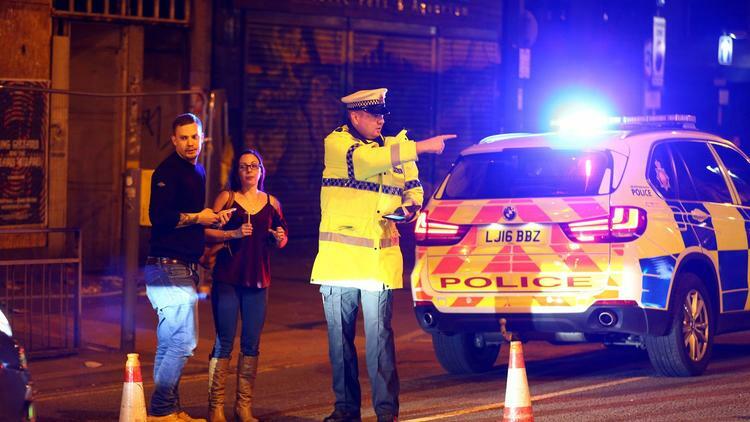 At least 19 people were killed and 50 injured Monday night in an explosion at an Ariana Grande concert in Manchester, England, that police are treating as a possible suicide bombing. The explosion happened near an entrance to the 21,000-seat arena just minutes after Grande’s concert ended with the song “Dangerous Woman” and the singer left the stage, witnesses said. British counter-terrorism investigators think the possible terrorist attack may have been the work of a suicide bomber who entered a crowded area outside the performance space where attendees were streaming out of the concert, according to U.S. law enforcement sources briefed on the investigation. They cautioned that all information is preliminary and video from security cameras will allow investigators to reconstruct the deadly events. A law enforcement official and a witness said the explosion happened near an entrance where fans typically pick up tickets. Cordons blocked off the entire area as a swarm of police cars and ambulances moved in and began evacuating bleeding concert patrons. “This is currently being treated as a terrorist incident until police know otherwise,” Manchester police said in a statement. Grande was not injured. “Ariana is okay. We are further investigating what happened,” said Joseph Carozza, the artist’s publicist with Republic Records, a division of Universal Music group. Concert goer Danny Keeling, 22, said he had left shortly before the event’s conclusion to avoid crowds, and “everyone was completely happy,” he recalled. “And the next thing it was complete chaos. We saw a guy being treated by paramedics who had holes in his back from where the shrapnel had hit him and there were kids with blood on them,” he said. Another witness heard a “huge explosion” near one of the arena’s exits. “Then everyone who was leaving started screaming and running the other way to another exit,” Sanders wrote in a direct message on Twitter. A huge Grande fan, she had come to the concert with her mother. She said there were no metal detectors and that security did not carefully check her mother’s bag. After the explosion, “I grabbed my mum’s hand and started running, following a lot of others towards an exit,” Sanders said. Outside, police were everywhere, trying to clear the area, she said. Gary Walker, who is from Leeds, was waiting with his wife for their two daughters to come out of the concert when the explosion happened just yards away. “We heard the last song go, and then suddenly there was a massive flash and then a bang and smoke,” he told BBC 5 live. He felt a pain in his foot and leg. As in previous incidents in Europe, people took to social media to offer lifts, rooms for the night and tea to those in need using the hashtag #RoomForManchester. Others used the hashtag to send out anguished pleas for information about the missing. “My friend is missing in the concert haven’t heard of him please contact me #Manchester #RoomForManchester worried and sick now,” read one tweet. Some concert goers began raising questions about security at the venue. Keeling said security personnel were checking bags, but not patting anyone down. “I told my friend you could have anything on you, and you can bring in anything,” he said. Grande was scheduled for additional performances on her Dangerous Woman Tour on May 25 and 26 at London’s O2 Arena, according to the website of the tour prompter, Live Nation UK. Times staff writers Randy Lewis, Todd Martens and Alexandra Zavis contributed to this report.